Syrian Army Continues Its Operations In Jobar And Ayn Tarma (Photos, Videos) 4.1 out of 5 based on 10 ratings. 10 user reviews. According to pro-government sources, the Syrian Arab Army (SAA) have seized a number of new buildings near the Ayn Tarma Roundabout area in eastern Damascus. The Syrian Air Force has carried out a number of airstrikes on positions of Faylaq al-Rahman and Hay’at Tahrir al-Sham (HTS) in Ayn Tarma and Jobar. The SAA killed more than 15 HTS fighters and destroyed a HTS vehicle in the Ayn Tarma Triangle. Meanwhile, Faylaq al-Rahman fighters damaged a SAA battle tank in Ayn Tarma with a non-recoil rifle SPG-9. Faylaq al-Rahman also managed to destroy a BMP vehicle of the SAA in the same area. Faylaq al-Rahman has announced that it does not participate in the Astana talks because of the SAA attack on the Jobar and Ayn Tarma. Faylaq al-Rahman also claimed that it had been committed to the ceasefire, but the SAA breached it when it attacked Qaboun district east of the Syrian capital. 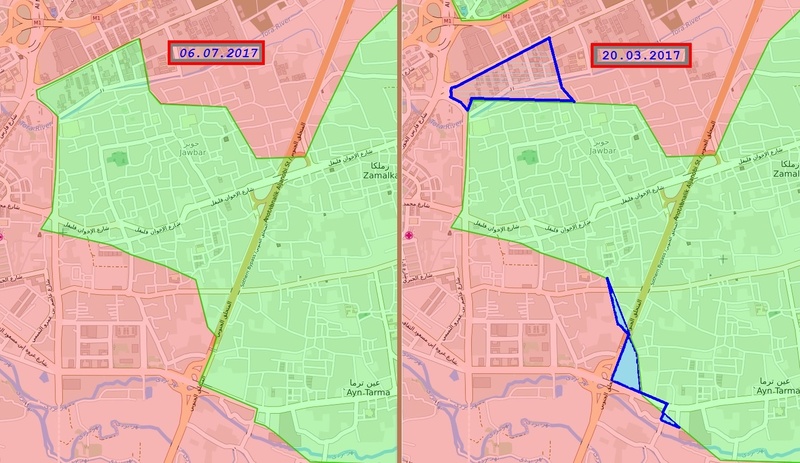 However, it’s worth mentioning that Qaboun district wasn’t within the ceasefire zones. How many terrorist have dead?..this is the only important! The BMP Fake al Scammin allegedly destroyed moved away from the hit had a buckled the turret if lucky , since it is a rpg 9 not effective against armor . They lie too much hence the name think they are learning to make up nonsense as the US does. US proxies are learning the lying skill from their master.